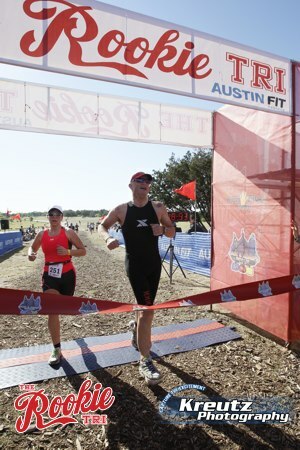 I couldn't wait for the Rookie triathlon this year, I'd been working hard on my running and really thought I had a chance at winning my age group in the Texas Tri series. I've never raced the Rookie since it switched from the Texas Ski Ranch to Decker Lake/Walter E Long Park. As much as the ski ranch was a trek south, and lots of people hated the swim, I hate the run at Decker. It's a personal thing, given my leg. I quit the Longhorn Half over there on the run; then at another race, completely twisted an ankle heading down the long hill on the back part of the 5k course, and everyone hates coming back p the hill to get to the finish. However, the standing joke is, no matter how experienced you are, if you take longer than an hour, "you are a rookie!". So, I was all set to take this very seriously. I showed up early, got rock star parking, set-up my bike, gathered up the rest of my race gear and walked the bike, in the right gear, brakes checked, shoes mounted over to transition. I'd already bodymarked myself. Walked in, found my place, racked my bike, put down my runs shoes, race hat, race belt; put my bike helmet/glasses on the aero bars, exchanged terse "good mornings" with a few guys in the vicinity and walked out. I was there no more that maybe 2.5-3-minutes. After that, I went back to the car, napped for 20-mins; woke up, stretched, did my warm-up drills and before I knew it, race time. The swim start was a group start, male age groups 45 and older, there was a lot of bumping but after the 2nd turn the biggest problem were the slow swimmers from the earlier waves. However, the swim is so short you just have to go for it and deal with problems(or other swimmers) as you hit him. I was out of the water in what I thought was 3rd place; I had a perfect T1 and was pretty sure I'd passed Jesse in T1 and that I was following the lead guy out of T1. I got my feet in my shoes while rolling parallel to the park fence, I changed gear... nothing. Tried again, nothing. Tried shifting the chain ring, nothing. Frantically looking down I spot a lose cable from my DI2 electronic shifters. If you click on the picture, you can clearly see the disconnected cable. 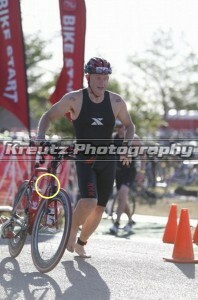 You can also see I was still wearing my Xterra Speed suit. I'd swum in this at Barton Springs over the winter, run in it after swimming a couple of times and decided it would be a good option for the Rookie. No tri shorts and top, just the speed suit. Anyway, off my bike, breathing hard, panicking, what should do? Options, spend ages trying to work out where to put the cable? Ride back to see James and the J&A Mechanics? Ride the course in a single gear? I was panicking... I couldn't see where the cable went, how did it come loose? I knew I'd checked it before I started... I jumped on and started riding. I got a decent speed heading down Decker Lane, not as fast as I know I could for just a single gear, small chain ring; around the back of the lake on the rollers was difficult, up the short sharp hill meant standing and powering up, and on. I did the dismount and into T2 trying to stay focused and have a good run. I'd been passed by a few people including Ralph, I passed him back. I had no idea where I was and just ran. I felt good on the run in but knew I was way off. Total: 1:02:58 8/17 Age Group, 108.265 Men, 127/500 Overall. A few races have passed since the Rookie. As disappointed as I was to lose a significant opportunity, realistically, It's hard to see I'd have beaten Jesse Conrad who finished in 56:49, faster than I'd ever gone at the Rookie. I raced over the same bike course a couple of months later in the Couples Triathlon, my bike time there, off a more than double distance swim was 34:24. So, assume I could have done, that or slightly faster, I might have achieved 58:50, and I had a shot at 3rd in age group, which I've done before. Oh well.